Why can’t peace break out spontaneously? Well, apparently, it can. One hundred years ago, during the early days of World War I, soldiers along the trenches in Europe decided to celebrate Christmas with their own special brand of good will toward men – men on the other side of the conflict. By means of a fictional letter from a British soldier, the reader learns of the conditions endured by the men on both sides. Rain, for example, meant three-foot-deep mud that seeped into everything. 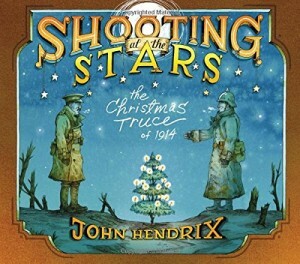 On Christmas Eve, the British soldiers started hearing singing. Poking their heads up, they could see lighted Christmas trees along the German trenches. Many soldiers crossed into No Man’s Land to shake hands and exchange trinkets with men from the other side. 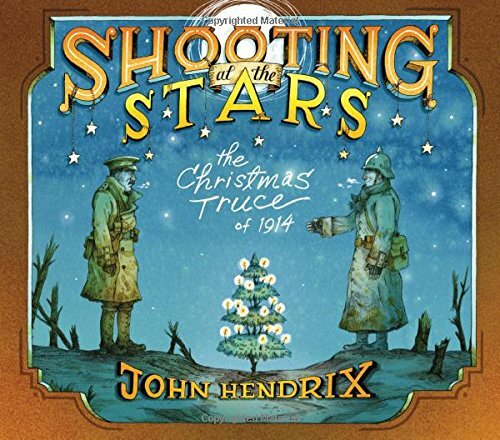 When Christmas was over, the war resumed, but the men were reluctant to shoot at their new friends. Man shot at the stars instead. The truce really happened. The troops were severely reprimanded for fraternizing with the enemy. And another year of heavy fighting meant that the spontaneity did not carry over to the next year. But third grade readers and above can learn a lot about history, the conditions of war, and international relations from the text. Core concepts are strengthened by this fictionalized account. The realistic and beautiful illustrations enhance the story. 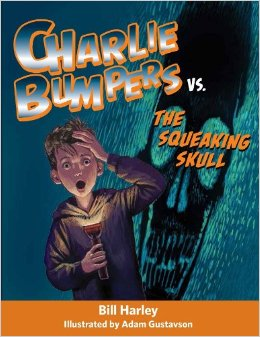 Charlie Bumpers is a typical fourth grader who is afraid of scary movies, but certainly doesn’t want any of his friends to know it. His brother tries to help prepare him for a Halloween sleep over by telling him a scary story every night before bed. Each night the “practice story” becomes a little scarier. Of course, Charlie had another purpose for wanting to go to this particular sleep over on Halloween night, too. It was so he didn’t have to take his little sister out trick or treating! Lots of young readers will relate to that problem. So, he gets to the sleep over and goes trick or treating in a new neighborhood with really big houses and rich people. They all expect to get lots of extra candy at such big houses, but instead find themselves getting only one piece at each house. And the houses are so far apart they only get enough candy to fill the bottom of the bag. While the story is somewhat predictable to adults, it will provide fresh excitement for the grade three readers and even the strong grade two readers. Bill Harley is able to capture the realistic voice of the fourth graders as well as of their parents. The black and white sketches by Adam Gustavson also help get the reader into the story. The pacing and vocabulary is spot on for developing independent readers. They will have great fun getting to know these characters and will enjoy reading more stories in this series. America was preparing for the Chicago World’s Fair for 1893, and anxious to surpass France’s Eiffel Tower. But what could possibly do that? A contest was announced and engineers began sketching all manner of tower’s and novelties. George Ferris won the contest with his idea of a giant wheel that people would ride in closed rooms furnished with velvet chairs. While the contest sponsors liked his magnificent idea, they never thought it would work. In fact, they refused to help finance the project. They seemed to sit on the sidelines watching for it to fail. However, at the conclusion of the fair, they were so amazed by its overwhelming success, they decided to name the magnificence wheel after its creator. Kathryn Gibbs Davis has written a fascinating account of this episode in American history, including quotes and facts. The illustrations by Gilbert Ford are realistic and magical at the same time capturing the environment that was the 1893 World’s Fair. The illustration of the fair at night is especially meaningful when readers learn that this introduction of electric lights at night gave L. Frank Baum his idea for the Emerald City in his Wonderful Wizard of Oz. 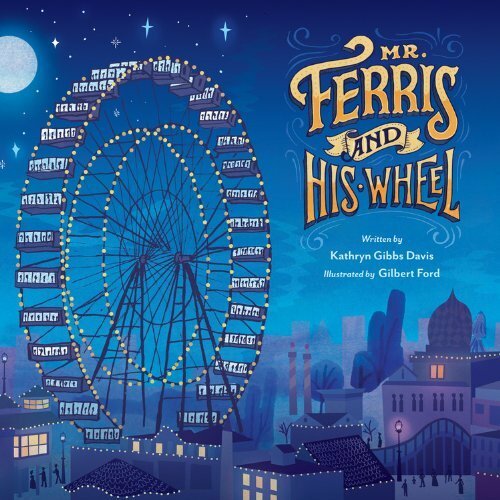 Grade three readers, as well as those younger and older, will be interested in the first Ferris Wheel and amazed by its size. Core curriculum standards of American history, science, geography, and literacy skills will be met by use of this book. It is an excellent example of combining a narrative with factual paragraphs. This book is an excellent addition to every nonfiction library. Extras: Endpapers include a Selected Bibliography, Quote Sources and related websites.